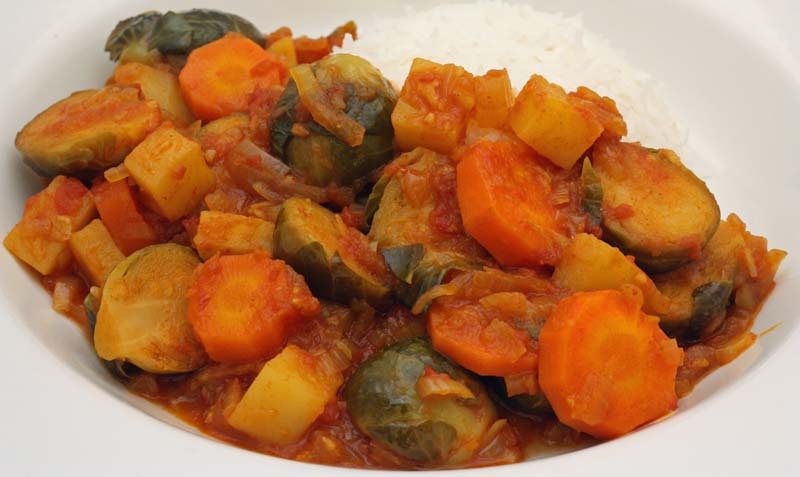 The sliced carrots, cubed potatoes and halved Brussels sprouts are dyed turmeric yellow and coated in an Indian style spicy sauce. 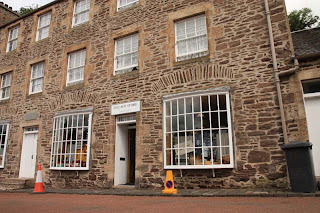 The other reason the photograph is awash with an orange tinge is the lack of natural lighting in the evening. The winter brings with it darkness, so it is no longer conducive for the home food blogger/amatueur photographer to take reasonable picutres for his/her blog. Saying that though, the natural light outdoors is not good either. Its dark when I wake up and its dark when I go to bed. Regardless of the lighting, the dish was surprisingly okay, not delicious - just okay. This recipe is based on my Green Bean Salan. I don't think I've eaten any green beans this year. Fingers crossed next year will be different and better. I will once again be enjoying home grown veggies, even if they are found to be growing in pots. Oh I really can't wait to move now - we've been living under a permanent dark puddle the last few months, literally and metaphorically, surely something good must be due to happen to one of us now, if not the both of us. In a large wide pan, melt butter then add the minced onions, garlic and ginger and cook until transparent, add the spices and the fresh chillies and cook until the fat of the butter comes to the surface. Add the tomatoes and cook until well integrated. 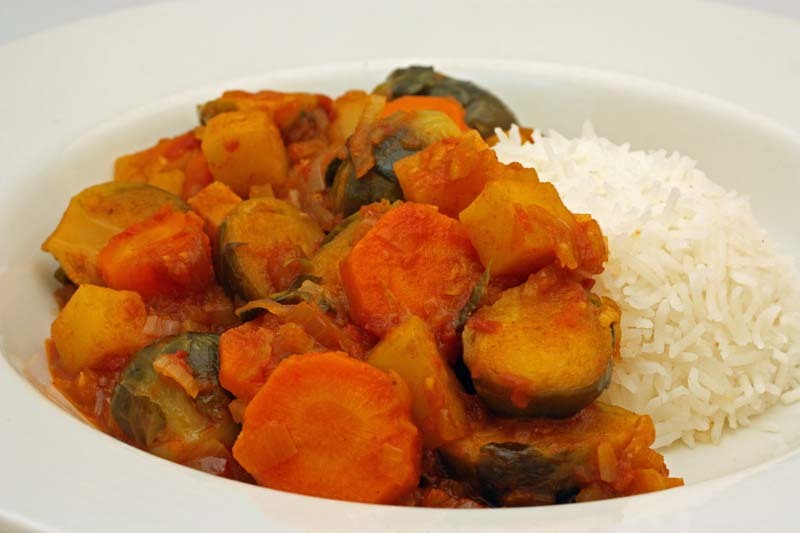 Then add your chosen vegetable, stir and turn heat down until the vegetables are well cooked. Keep stirring to stop the vegetables from sticking to the pan, when vegetables are cooked. 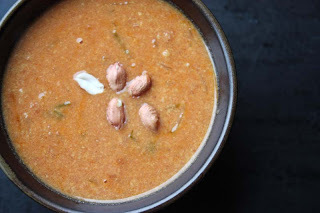 You can either just serve it as a dry curry (best eaten with roti or naan bread); Or add 150ml - 250ml water to the pot, bring to the boil, let it simmer until the flavours have infused into the water. Serve with rice. 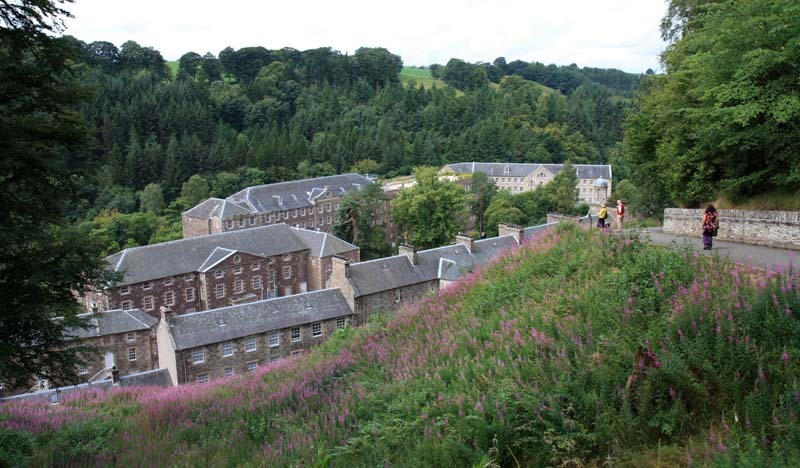 So here let me share with you a handful of photographs of when we visited New Lanark World Heritage Site in the summer. 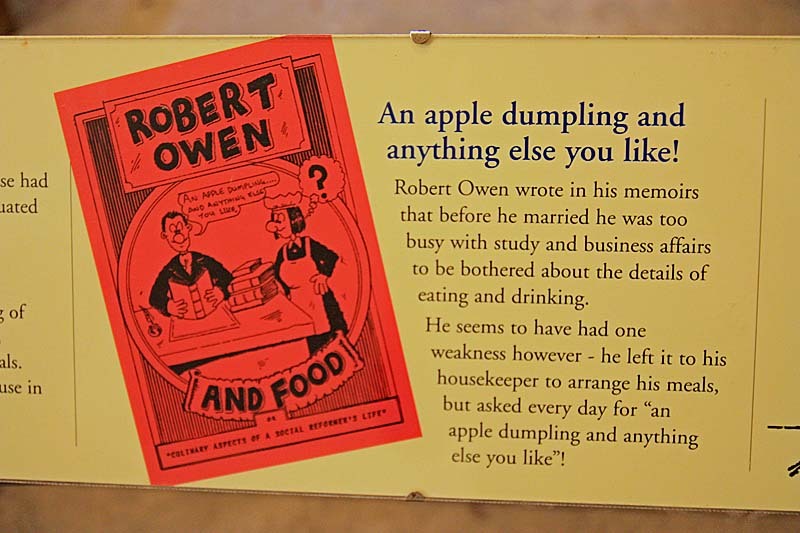 Here is Robert Owens 'Apple Dumpling' recipe. Click on the image. This particular image is also my entry for Susan's - Black and White Wednesday #21. This is relatively new weekly blog event set up by Susan of The Well Seasoned Cook. 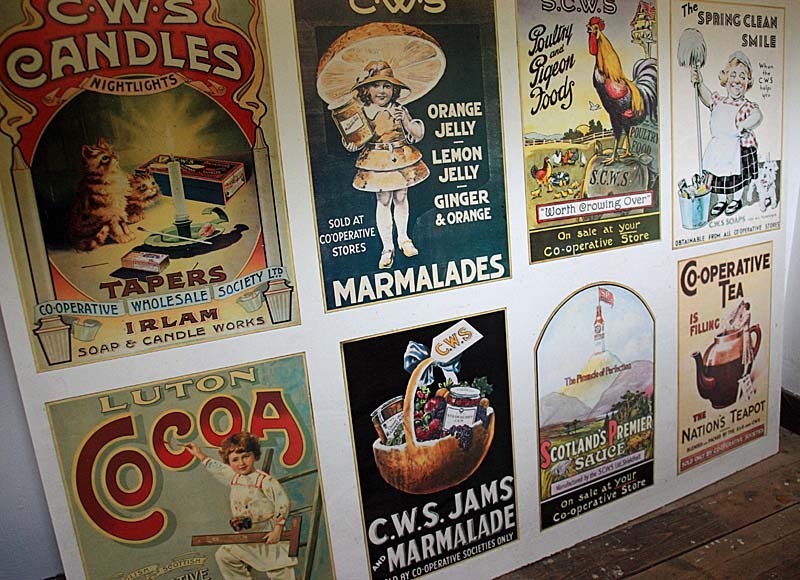 Here she encourages us all to appreciate black and white photographs once more, albeit through culinary means. A very easy peasy pasta dish for lunch. I actually liked how the sprouts supped up the flavours from the infused garlicky chilli olive oil . This mellowed the bitterness of the sprouts making it both sweet and spicy. 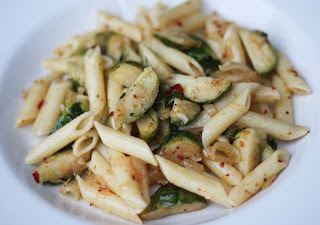 Inspiration for this pasta dish came from two fellow bloggers Mark Willis and Plummy Mummy at Chili Paper Chains who suggested using chilli with it. As a spice head, I don't know why I did not think of it and now I have a number of ideas coming my way - one obviously being a Indian curry style dish and the other - deep fried like pakoras. I am really liking the idea of Brussels Sprouts Pakoras - maybe this weekend! I am sharing this at Presto Pasta Nights #242. 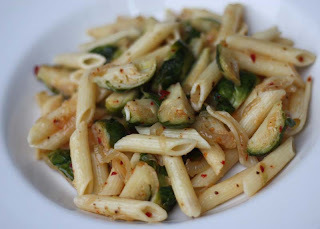 PPN was founded by Ruth Daniels of Once Upon a Feast and each Friday night a different host posts a roundup of pasta dishes submitted by bloggers from around the world. However this week, PPN is being hosted by Ruth. Cook penne pasta for 2 people. Meanwhile, heat 2 tablespoons olive oil in a wide pan, then add in a medium onion that has been finely sliced. Cook slowly stirring occasionally, until soft and caramelised. Then stir in sprouts that have been quartered, 2 cloves of minced garlic and chilli flakes to taste. Cook on medium heat until the sprouts are just tender and golden brown. Season with salt and pepper. Stir in the drained pasta, drizzle with extra olive oil and serve immediately. Whilst I was vacuuming, I knocked down one of the paperback cookbooks hidden on the bottom shelf. A much under-used cookbook called Lean Bean Cuisine. I flicked through it quickly, finding myself enticed by a number of legume based recipes. As the book was random, honest - it landed at my feet - it occured to me that I should enter this months No Croutons Required Does Random Recipes. This is not the way I normally cook, I tend to go by what ingredients are in season and then come up with a recipe, but I was up for a new challenge, moreso as I've never done 'Random Recipes' before either. So I closed my eyes and flicked through the first few pages and ended up on a 'Gungo Pea and Coconut Soup' recipe. This made me smile, as I have three tins of gungo peas, also known as pigeon peas and a can of coconut milk at home. The only ingredient I had to go and pick up was butternut squash. The soup was lovely and light, truly embracing the characteristic flavours of the Caribbean: coconut milk, thyme, hot peppers, and rum. I have to point out though that the flavours of both the jalapeno pepper and rum is mild, so don't worry about it too much; if you so wish, feel free to omit it. I think the soup will still be lovely and will transport your mind, if not your soul to the sunset warmth of the Caribbean. So as mentioned, this is my entry for Novembers No Croutons Required. NCR is a little different this month as Jacqueline of Tinned Tomatoes has teamed up with Dom at Belleau Kitchen. to create No Croutons Required Does Random Recipes. I do hope they like this soup as much as I did. Heat the oil in a large saucepan and add the onion, carrot, celery, garlic and jalapeno pepper. Saute over medium heat the vegetables are tender, about 10 minutes or so. Add the squash, half of the beans, stock, rum parsley and seasonings. Bring to a simmer and cook gently for 35 minutes until it begins to thicken, stirring occasionally. 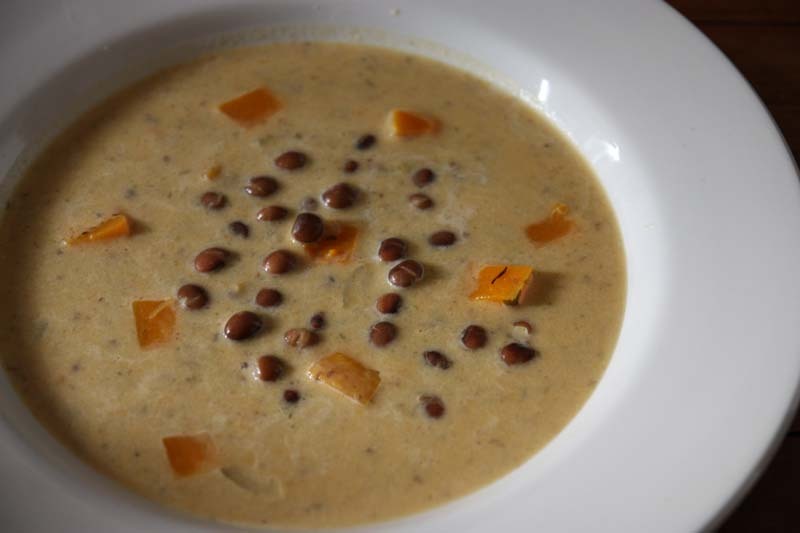 Season with salt and pepper, then stir in the coconut milk and continue to simmer for a couple of minutes. 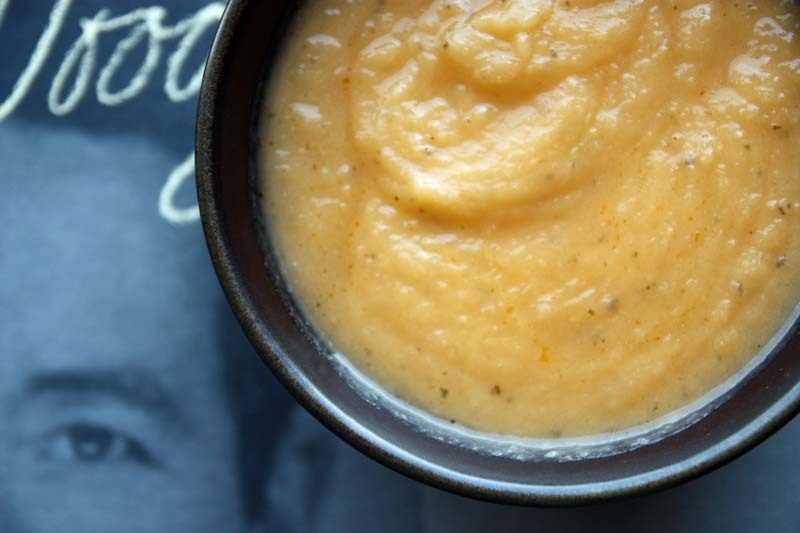 Transfer the soup to a food processor and blitz until smooth. Return to the pan, add the remaining beans and reheat before serving. 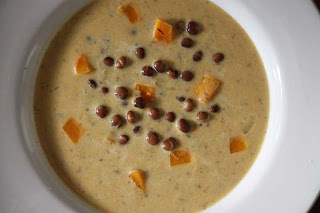 Adapted from Lean Bean Cuisine by Jay Solomon. Yes this is virtually the same Brussels Sprouts and Shallots I made about two weeks ago, albeit with some minor modifications and a little more prettier in presentation (if you can say that about sprouts), but I put my hands up in my defence - I really did not want to make it again - more bitter and niffy sprouts - no way. However the man in the house who doesn't mind them so much, picked up a Brussels Sprouts tree. I think it was his sneaky ploy to get me to eat more of them. I plucked the tightly wrapped balls of green off the stalk and chucked them into a bowl. I just couldn't get my creative juices flowing on the day - so it ended up being savoury tart again! A day or two later, some inspiration starting coming to me .... as well as suggestions by number of fellow bloggers. So I must forewarn you in advance, I'll be featuring a number of recipes this week with Brussels sprouts, not that I love sprouts but because of the Brussels Sprouts tree that was purchased. So you may not want to come by if you dislike sprouts with a passion, though my aim this week is to try and persuade you and myself to try other recipes with these mighty green nuggets. I am submitting a slice of this Brussels Sprouts Tart to Ren Behan at Fabulicious Food who is hosting Novembers edition of Simple And In Season. 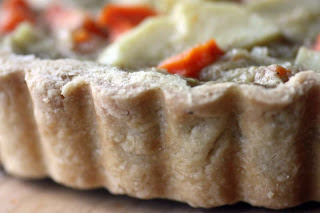 For shortcrust pastry - follow here for the pastry recipe. Blind bake the pastry tart tin and set aside. 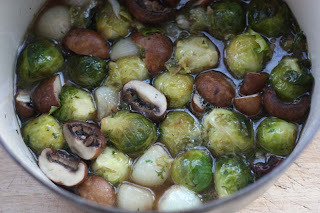 Heat the oil in a wide pan, then add in the onions and cook slowly until soft and caramelised, then stir in the sprouts and garlic and cook for until the sprouts and shallots are just tender and golden brown. In a measuring jug, add the milk, and beat eggs, about 80g of the blue cheese and season with pepper and a little salt to taste. 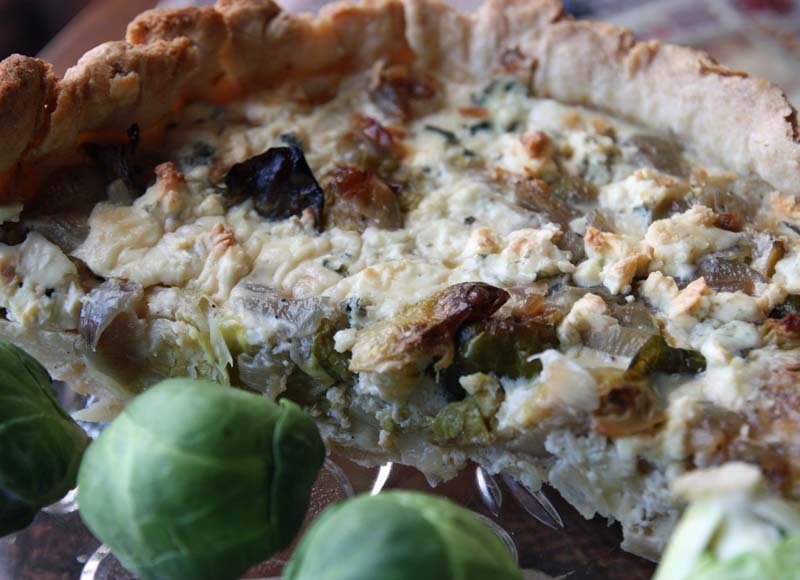 Spread the soft caramelised onions at the bottom of the tart, then top with the sprouts – either cut side up or cut side down – it is your choice. Pour over the liquid mixture, then top with remaining cheese and bake in the oven for 35–40 minutes, until set and a little golden on top. 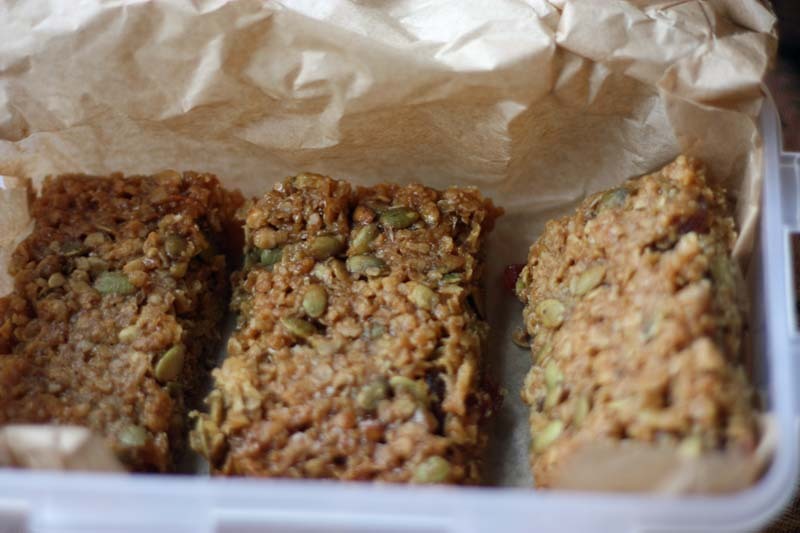 When I was working I would often make muffins or flapjacks for the working week ahead. These days I make them for the weekend, should we find ourselves venturing outside of home territory. 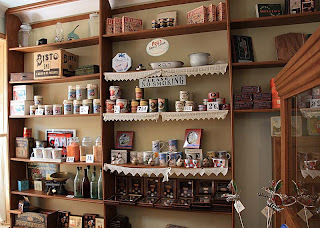 We are much more organised and will now make a flask of coffee and take small tub of home bakes. This is our frugal and thrifty way of saving pennies and not spending pounds on a High Street latte, espresso or muffin. 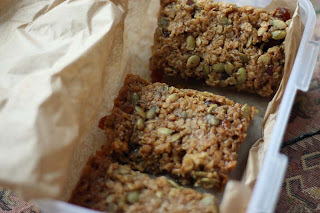 These flapjacks are made with dried apricots and pumpkin seeds, but you can easily make it with sultanas, raisins, sunflower and sesame seeds, as well as chopped nuts, almonds would be great. So let us see where this weekend takes us ....weather dependent of course. Method Melt the butter, sugar and golden syrup in a saucepan on a low heat. Then stir in the oats, apricots and pumpkin seeds, and combine thoroughly. Spread and flatten the mixture into a lined baking tray. Bake at gas mark 3 for 30 minutes, until golden brown at the edges. Leave to cool completely in the tin, then cut into squares with a sharp knife and turn out. This thick, almost velvety golden bowl of Swede Soup was made in the same manner as the Chilli Spiked Roasted Pumpkin Soup, but we didn't enjoy it the same. Something was missing, it lacked depth. I think this soup needs body and would be helped with a proper soup base made from onions, carrots and celery. I know for next time, still it looked pretty good that I had to share it. And of course it wasn't wasted. Like it or not, we did manage to finish it with some home made machine crusty bread. If you still want to try it for yourself, here is the recipe of sorts. Simply peel and chop a medium Swede into small cubes. Toss it with a little olive oil and bake in the oven at Gas mark 5. Roast for about 45 minutes or until soft and tender. Then tip it all into a food processor; or food blender, along with some vegetable stock, about 1 pint to 1½ pint and add some salt and pepper. Blend to a puree. Return to the pot and reheat. I know this sounds like an unusual recipe; and it is - its effectively a Thai -style Green Curry in a pastry base, still I was still a little curious to try it out and see if it worked. What's more its made with root vegetables. This is not an egg set flan, but a little oozy when you slice into it. 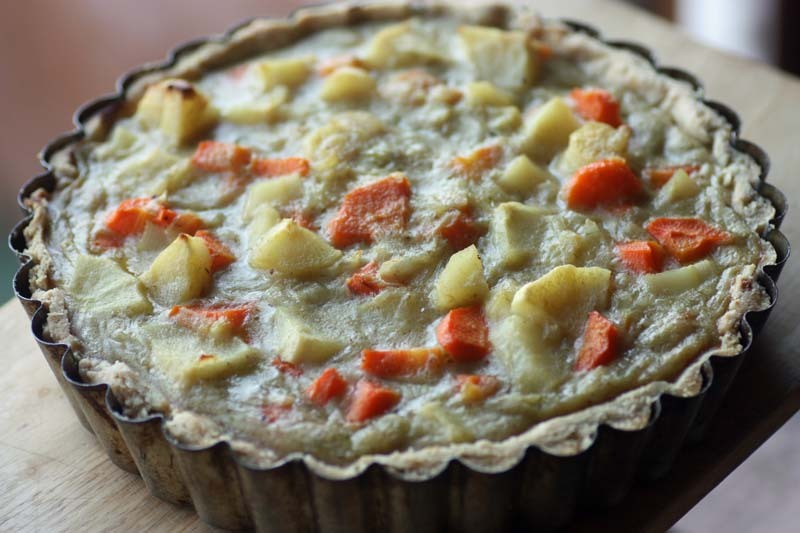 Now having made this, I am not completely convinced it works well in the pastry base, so I am not going to try and persuade you to try it, unless of course you want too. I will say this though, it tasted okay. I particularly liked how the Thai curry flavours infused the parsnip. I served this flan simply with some rice and green peas. Preheat oven to gas mark 6. Roll out the pastry and use to line a 8- 9 inch round dish, then back blind. Set aside to cool. Now make the filling. Bring water to the boil and parboil the root vegetables until just tender. Drain and set aside to cool. In a wide pan, heat the oil, then cook the onions until very soft. Add the flour to make a roux, stirring well. Add the curry paste, the stock and the milk. Bring to a gentle boil, until the mixture begins to thicken a little. Season with salt and pepper to taste and then stir in the vegetables and coriander if using. Pour this into the pastry case and bake for 30 minutes. Adapted from Another Dinner is Possible. This autumnal 'Caramel Apple Cake' certainly looks the part. I wish I could have taken the photograph next to some naturally sun drying autumnal orange, yellow and burnished leaves, but its rather muddy in my garden, so it had to be taken against the wooden panels in my flat. Upon cooking the sugar becomes sticky and caramel-like, both these elements coating and colouring the cake beautifully. 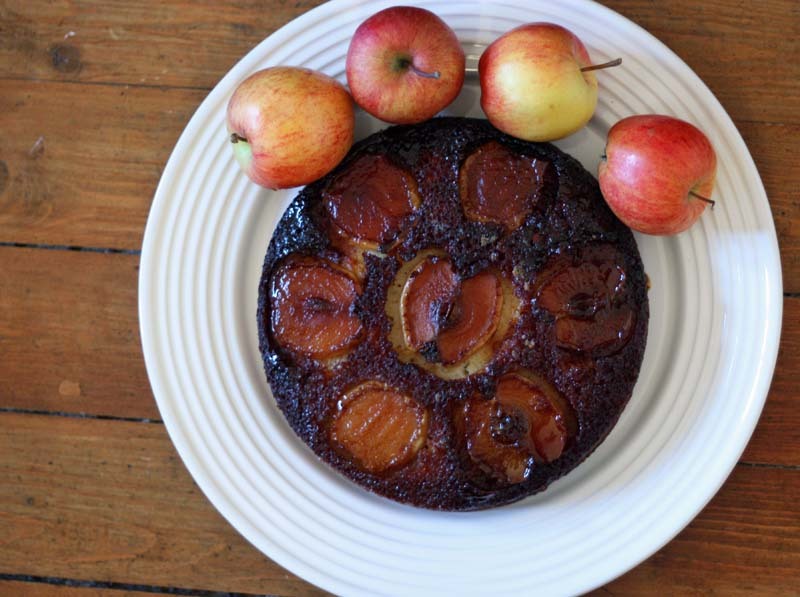 But beware when making the topping, a minute or two over and it can become a little too dark, and thus a little burnt around the edges, (a bit like this one). 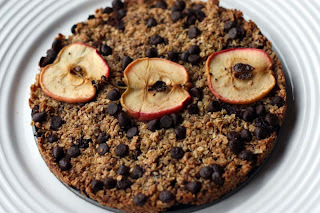 For me the best part of this cake was the apples and how they became soft - apple pie like. 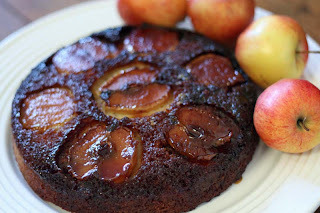 I am sharing a slice of this Apple and Caramel Cake with Cook Eat Delicious - Desserts. 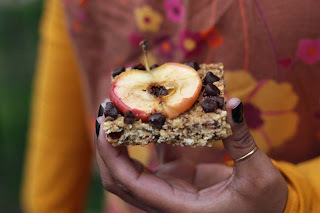 The theme for November is apples and is being hosted by Nayna at Simply Food. CookEatDelicious was founded by Raven at Cook Eat Delicious. Preheat the oven to gas mark 6. Lightly grease a round 8 inch cake tin and line the base with parchment paper. Put the sugar in an even layer in a heavy based saucepan and heat gently, without stirring. When it begins to melt and turn brown, swirl the pan so it caramelizes evenly. Quickly tip the caramel into the greased base of the cake tin and ensure it is evenly coated. Leave to cool. 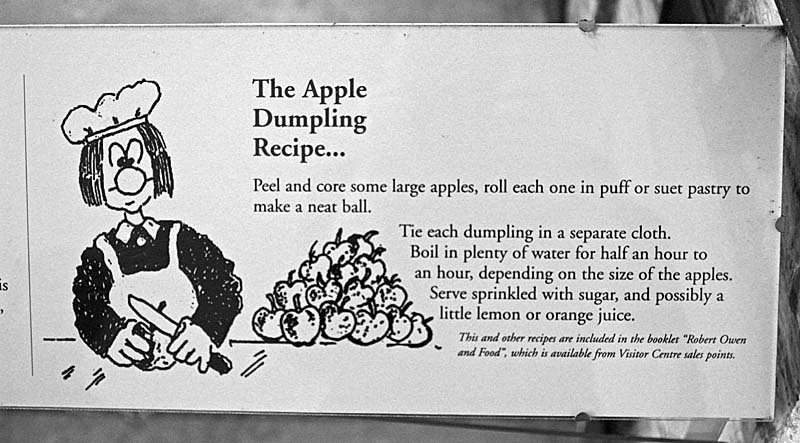 Meanwhile, slice the apples (you may not need to use up all the slices - so enjoy a natural taste of apple). Arrange the apple slices on top of the caramel, which will have hardened. Beat together the butter and sugar with a wooden spoon in a large mixing bowl until pale and fluffy You can also use a food mixer with a paddle attachment for this. Add then eggs, gradually, beating after each addition. Fold in the flour, baking powder and cinnamon with a large spoon, then stir in the milk, mixing until you have a smooth consistency. Spoon the sponge mixture over the apple in an even layer. Place the tin on a baking sheet and bake in the oven for 45 - 50 minutes or until a skewer inserted into the centre comes out clean. Remove from the oven and leave the cake to cool in the tin for a few minutes, then turn out onto a plate. Adapted from Tana Ramsay's I Love To Bake. These apple and chocolate flapjacks are more like a museli or granola breakfast bar, in that they are dry and not sticky or overly sweet. The sweetness comes chocolate chips and the natural sweetness from the grated apples. And of course to demonstrate the apple content, I had to press a few apple slices to the top. I am sharing some of these flapjacks with Choclette of Chocolate Log Blog and Chele of The Chocolate Teapot for this months We Should Cocoa Challenge. 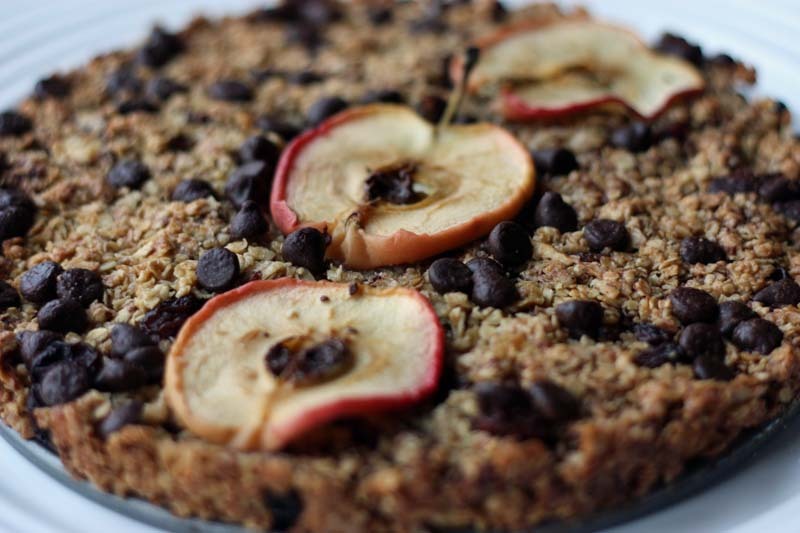 The theme for November is to create a chocolate dish with the inclusion of apples and it is being hosted by Chele. Preheat the oven to Gas mark 6. Lightly grease a baking tin measuring about 8 " by 8". My baking tin measured 8 by 8 inches. Melt the butter in a saucepan. Stir in the sugar and golden syrup. Combine the butter, sugar and syrup with the oats. 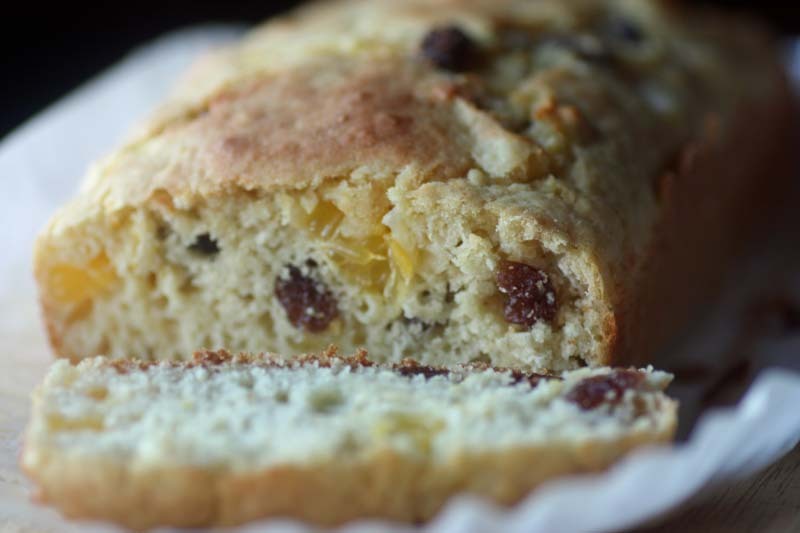 Stir in the raisins and grated apples and raisins . Spread into the greased baking tin, evenly scatter the chocolate chips then pat down with a spatula. Bake in the preheated oven for 20 minutes until slightly brown. Leave to cool before slicing. 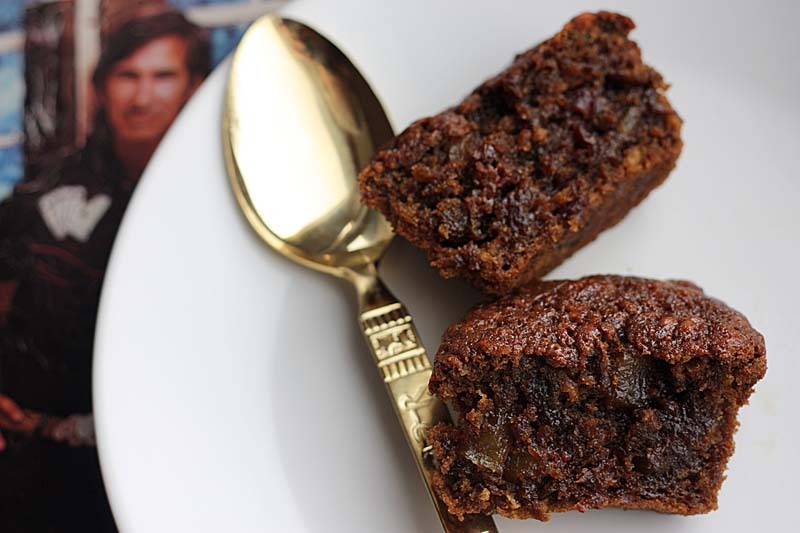 If you like gingerbread cake, then you are going to like these beetroot and gingerbread muffins. I made these muffins a little while ago - in between travelling to and fro Essex and Wales from Scotland. So I can't rant on about them as much as I would like, but I do remember them being extremely sweet and sticky and such a delight to eat. Each bite was soft with a burst of spicy warmth from the stem ginger pieces. A bit like Brussels sprouts, I have an aversion to beetroot. But I must admit since starting my blog, my opinion of beetroot has changed a lot (can't say the same for sprouts!). I am not saying that I love beetroot, no no - but I don't dislike it either. However when beetroot is cooked like this, grated and lost in a sweet crumby cakey textures, how can you not try?! I saw the recipe for these beetroot and ginger muffins on the Love Beetroot website. Its aim is to share the beautiful side of this earthy crimson vegetable. 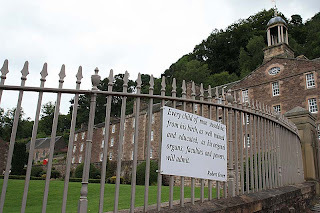 Its history, some beetroot facts, its health benefits as well as encouraging us, namely us Brits to eat more beetroot by sharing a growing collection of beetroot recipes. 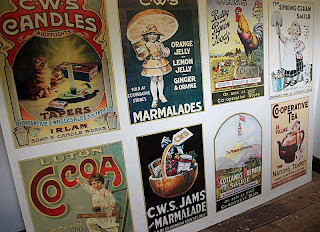 Some of these recipes were familiar to me, such as: beetroot dips, beetroot salads, beetroot pancakes, and of course the recently fashionable beetroot - chocolate cake. 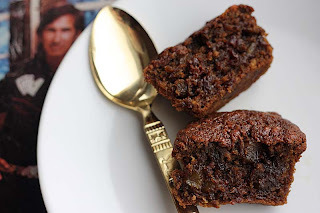 But alongside the familiar were a number of new recipes such as the beetroot bread, American style beetroot pie, beetroot, raising and stem ginger pudding - and the one that tempted me was the sticky ginger and beetroot muffins. 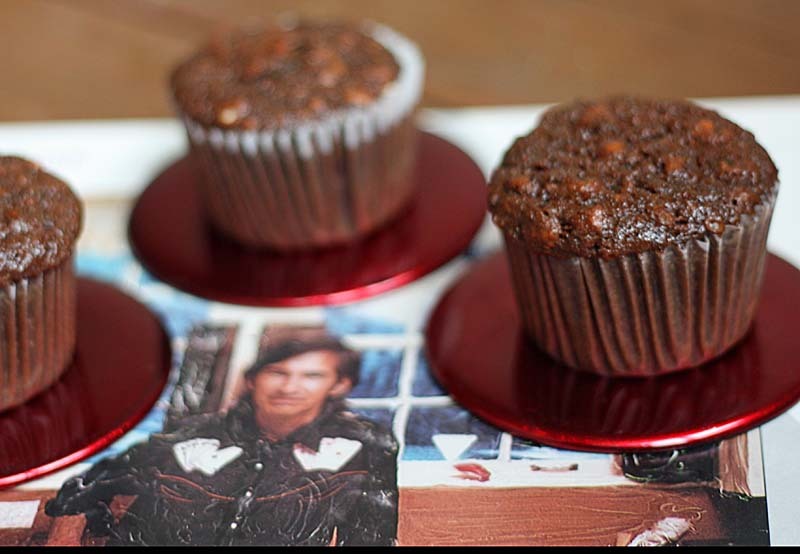 The original recipe uses cooked beetroot, I decided to use 'raw beetroot' which gave the muffins a slightly pleasant chewy texture. The original muffin recipe does have a ice glazing, but I decided to give this a miss as the muffins were extremely sweet. I am sharing some of these muffins with Jacqueline at Tinned Tomatoes who is hosting Bookmarked Recipes, a monthly blog event initiated by Ruth of Ruth's Kitchen Experiments, as well as to Karen's at Lavender and Lovage and Kate of What Kate Baked for the launch of their "Tea Time Treats" and a challenge of "Bonfire Treats and Ginger". 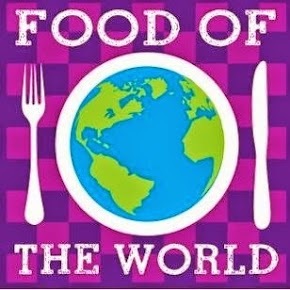 This is also linked to Mom Trends who is hosting Friday Food. Preheat the oven to gas mark 4, line a 12 hole muffin tray with cases. In a saucepan , add the golden syrup, black treacle, butter, dark brown sugar, stem ginger and both ground ginger. Warm gently until butter and sugar have melted. Whisk the eggs with the milk, then stir in the grated beetroot and bicarbonate of soda. Once the butter and sugar have melted, take the saucepan off the heat and add the milk, eggs and beetroot. Sieve the flour into a large mixing bowl and beat in the wet ingredients until they are smooth. the batter will be quite runny, so don't be alarmed (I was). Fill the muffin cases with the batter - this is easier if you use a jug - and bake in the preheated oven until firm but springy to the touch. Be careful not to overcook the muffins. Remove from the tin and allow to cool on a rack. These muffins keep really well for a few days in an airtight tin. Original recipe can be found here. I cannot remember the last time I had rice pudding. I think it must have been at my parents. Maybe I should not admit to this, but when I was a child, I remember scraping of the cooked in brown bits at the bottom of the pan, I can't see me doing that now somehow - well maybe when no one is looking. Rice pudding is not something I make- at all in fact, as D doesn't get on well with dairy milk so much, so I avoid making too many heavily milk based dishes, until now. 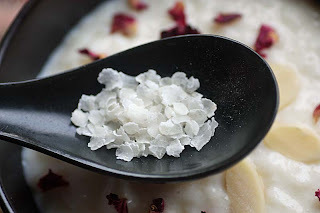 The skies here are constantly overcast and I feel a bit of ice in the air too, that its got me thinking of something more rib sticking than cake - so it is time for rice pudding. 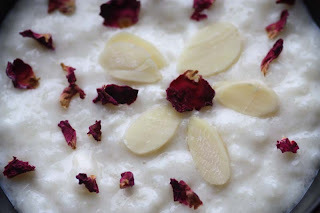 This began as a plain rice pudding, but I enhanced it with some rosewater and rose petals. I don't have access to any fresh roses, (duh it is November) though I do see some pink ones growing in the new neighbours garden, but I don't ask them - making do with the dried rose petals in my store cupboard. The last time I used the jar of dried rose petals was for the Rhubarb and Rose Bread, they impart a little colour if nothing else. 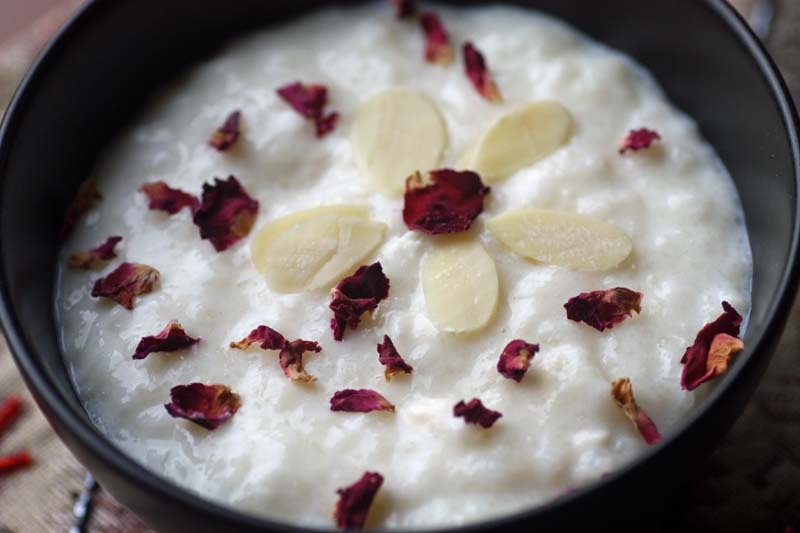 If you want to see a pink shade to this Rosewater Rice Pudding to signify the rosy aspect of it, I guess you could also add a little red food colouring, but that's up to you. I like it how it looks here. Another reason I wanted to make some rice pudding was that I had picked up a packet of flaked rice from the supermarket. It was okay, but I think I prefer proper rice for rice pudding, as it gives more of a chewy, teeth sticking texture. Rosewater (and cardamon) is a classic South Asian and Persian combination, however I know that for some of my readers 'rosewater' may not appeal being deemed either a little too feminine or perfumed (like lavender), so I am okay with them omitting this ingredient from the the recipe. For those of you wanting something a little more different to jeuge up your plain rice pudding, feel free to stir in perhaps maple syrup, or even for the big kids in you - golden syrup or maybe some chocolate - oh gosh the options are endless. I am sharing a bowl of this rice pudding at SimpleLives Thursday#70 hosted by Gnowfglins. 1 teaspoon dried rose petals. Wash and soak the rice for about 15 minutes. Drain the rice and then place in a heavy bottomed saucepan. Stir in the milk and sugar and bring to the boil. 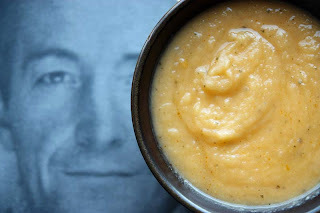 Then lower the heat and simmer for about an hour or until you get a rich, creamy texture. Add the rosewater or rose syrup, and dried rose petals. Simmer for a few minutes for the flavours to infuse, then serve garnished with the tasted almonds flakes. 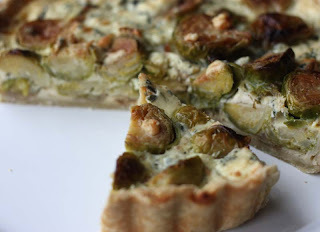 Have you noticed the accidental green and creamy white theme on my blog recently?! 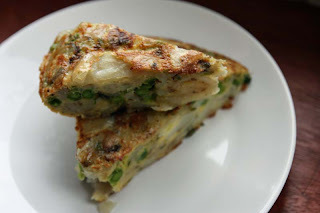 And just as I post this blog post, I notice that I've typed 'frittata' in the blog header, whereas it should have read 'tortilla' - a thick flat omelette made with potatoes and eggs. Oh well, its done now. ThisTortilla is made with the last of my homegrown potatoes; and peas from the freezer. Of course, its excellent warm for Brunch, but I think it would also be very good served cold, either for a working lunch or for when you are on the move. Heat oil in a frying pan measuring about 9 inches with high sides. Heat oil, add the onion and cook until soften, then add in the potatoes and cook for about 10 - 15 minutes until they are beginning to soften and turn golden, flipping them now and again. 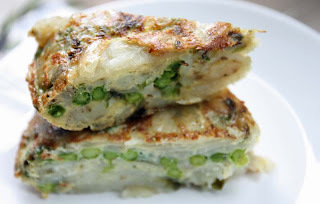 Season with salt and pepper, then stir in the peas and stir for a couple of minutes to evenly distribute the peas. Gently pour in the eggs, reduce the heat and allow to set. When it appears set and no longer soft in the middle. Cover the frying pan with a plate or lid and invert the potato tortilla over onto the plate or lid. Then gently slide the upturned potato tortilla back into the frying pan. Increase the heat and cook the tortilla for a few more minutes. 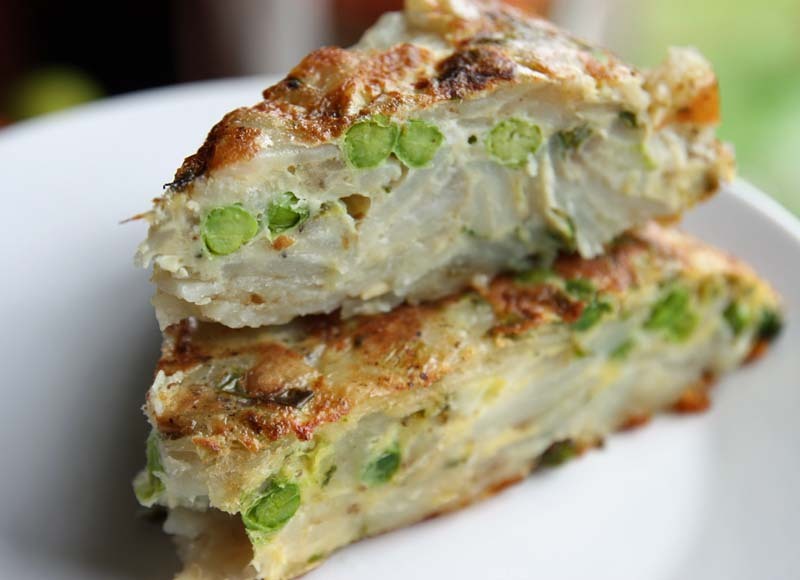 Transfer the potato tortilla onto a large serving plate and serve slices either warm or at room temperature. I know looking down in this cooking pot may not fill you up with much excitement, it didn't excite me either and I am the one cooking it. But its what you serve with it. 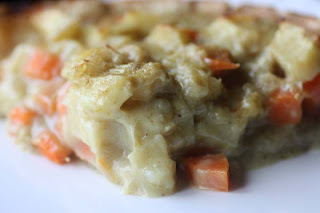 I served this ragout over mashed potatoes. The shallots and the sprouts serve as the two veg on the plate, and the chestnut mushrooms - the 'meat'. The vegetable stock also plays its part, as it simmers away it absorbs the flavours from the vegetables, becoming a good light gravy. 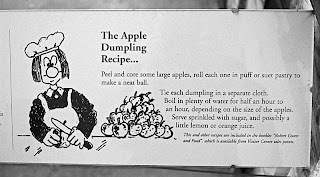 If potato mash does not float your boat, then perhaps some parsley dumplings; or a cobbler topping may tempt you to try this recipe. Heat the oil in a wide non stick pan. Add the shallots and cook over medium heat, stirring now and again. Once the shallots begin to brown, stir in the sprouts and sauté until they begin to soften a little. Then add the mushrooms and garlic and sauté for about 5 minutes or so. Pour in the stock and bring to a boil, when it comes to the boil then turn the heat down and simmer for a few minutes. 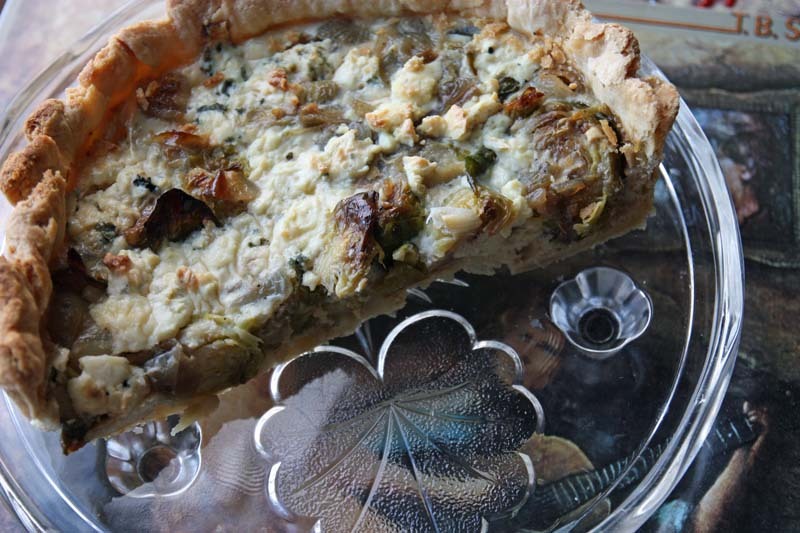 Adapted from Deborah Madison’s Vegetarian Suppers. Some of you may remember me mentioning my Dads allotment plot. Sadly my father has decided to give up this plot. 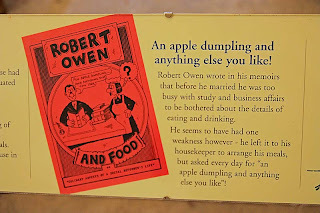 Not for not wanting, as he really is keen on growing some of his own vegetables; and its not the hard, back-breaking work of digging and weeding that's putting him off- he was well aware of all that before taking it on. Its actually the location of the allotment plot. 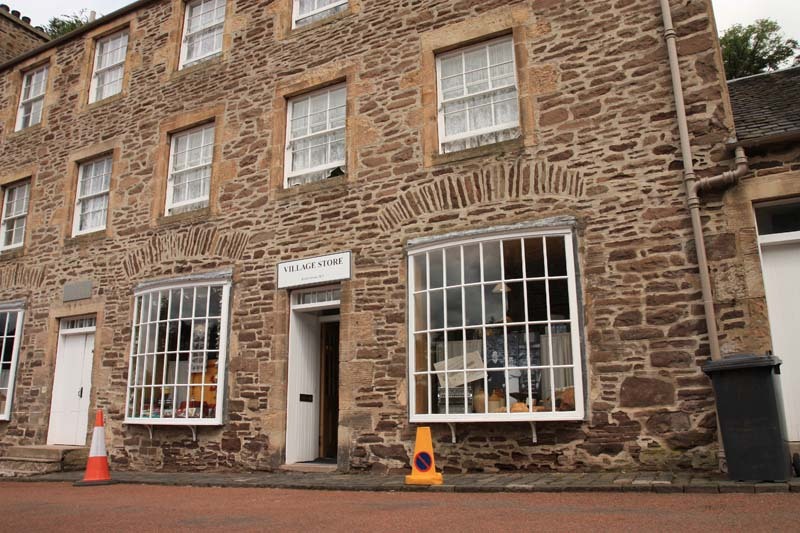 Its at the bottom of a steep Welsh hill. His plot is the only one down there. He had come to terms with the fact that it was at the bottom of the hill, carrying tools back and fro. 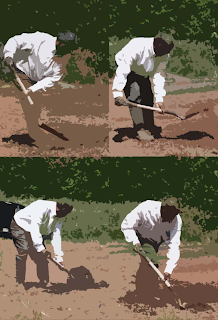 But its the access to the water that is adding to the expected hard work of owning an allotment plot. Even two water hoses attached together would not reach to the end of his plot. I have to point out though, they are not allowed to use water hoses there, so you can imagine walking up and down a steep hill with bucket loads of water for a95 foot by 40foot land can only last so long; even the energetic kids have had enough of it; squirming their way out of going with their GrandPa to the allotment. To add to this, my mothers has difficulty in walking, so has not been accompanying him to the plot either. My father is being realistic and envisages it getting much worse when the heavy rains and snow, making the downhill (or uphill) path slippery and therefore dangerous, so he made the decision to hand back the keys. I also feel a little guilty - I was mean't to share and maintain the plot with him. 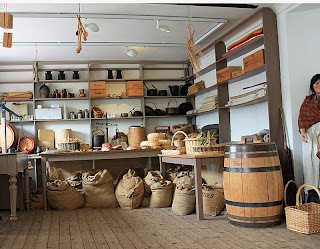 But my move down south has been hampered by circumstances, so he was not getting the shared interest and enthusiasm from the others in his growing ventures. It has however dawned on me now, why these particular plots on this site were/are available - location and access to water. Its not all bad news, he hasn't given up totally. He did a little research and has registered with another allotment site. Just have to wait and see when he gets a new plot; and his growing ventures begin again; and hopefully this time I will be able to be a bigger part of it. If there is one vegetable I struggle with eating still to this day, it has to be Brussels Sprouts. Even when I try to convince myself that they are only little baby cabbages, I get put off by the nose wrinkling wiff of them whilst cooking. To add to that they taste awfully bitter, that no amount of brown sauce can disguise it dominant flavour. 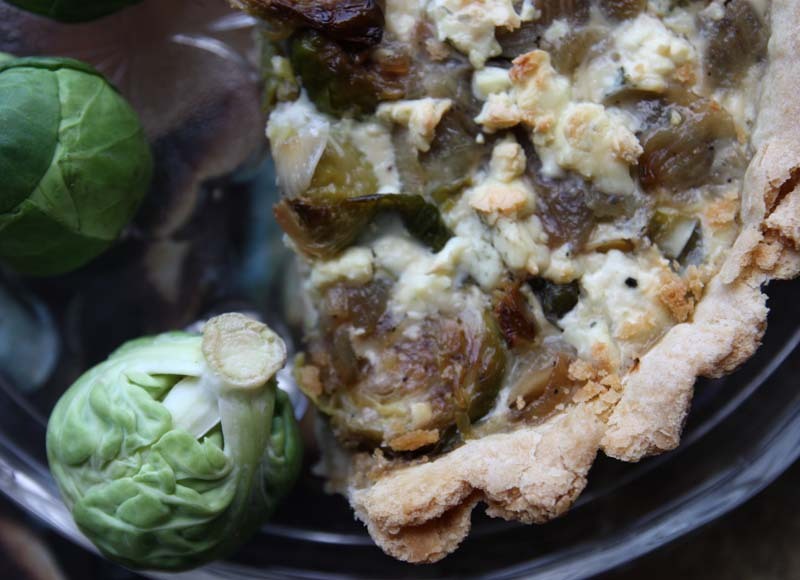 Having said all that though, I have found way of enjoying them, such as my Christmas Brussels Sprouts Pie and Brussels Sprouts Hash. 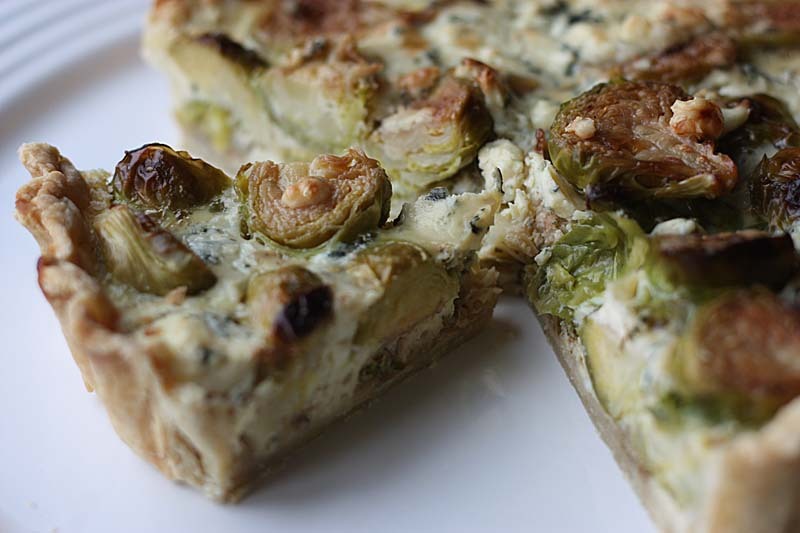 In this tart recipe, the sprouts bitter undertones are sweetened a little by the accompaniment of caramelised shallots and further lifted by the blue cheese. I actually found myself enjoying this, so much so went back for another small slice. Its better enjoyed warm , and just about okay cold. Admittedly the food presenter in me could have presented the tart in a more appealing manner, with green nuggets peeking through the cream and golden layer, but I wasn’t really thinking at the time. You can just steam or boil the sprouts, but you don’t get those deep caramel flavours. Follow here for the pastry recipe. Heat the oil in a wide pan, then add in the shallots and cook for a few minutes, then stir in the sprouts and garlic and cook for 6 minutes until the sprouts and shallots are just tender and golden brown. 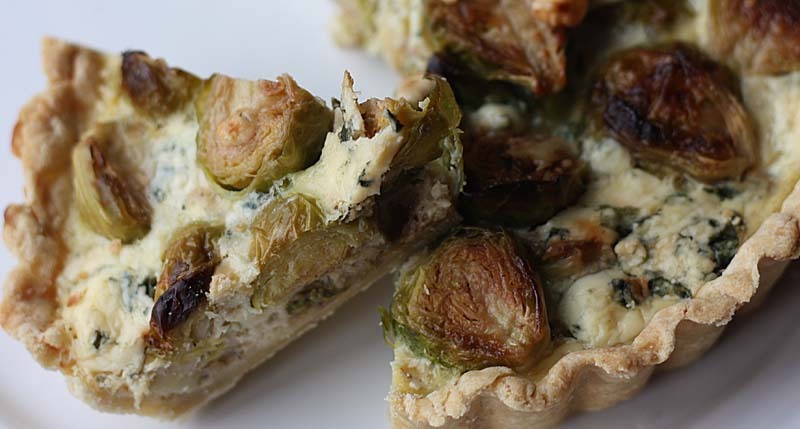 Spread the soft caramel shallots at the bottom of the tart, then top with the sprouts – either cut side up or cut side down – it is your choice. Pour over the liquid mixture, then top with remaining cheese and bake in the oven for 35–40 minutes, until set and a little golden on top. This is really a scone gone wrong recipe. The wet mixture salvaged by pouring it into a loaf tin to create a fruited bread instead; and my oh my it turned out pretty well. The original scone recipe from Lucy The Kitchen Maid uses an orange, but as I had a bowl of tart clementines in the fruit bowl, I decided to replace them in the recipe. The clementines were a tad bitter, but they worked well next to the natural sweetness from the sultanas and the delicate orange flavours in the background. 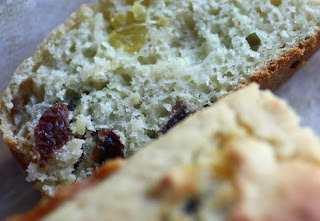 A generous wedge of this bread was sliced and toasted and then generously buttered - it was lovely for breakfast. As requested here is the adapted recipe. I would like to point out, I cannot find the scrap paper where I converted the cups to grams and ml, so the recipe for the time being will be in cups. Preheat the oven to gas mark 6 and line loaf tins with parchment paper. Sift the dry ingredients into a bowl, then stir through the sultanas. Whisk the remaining ingredients together in a jug, then stir in the chopped Clementine pieces. Carefully pour this thick liquid mixture slowly into the dry ingredients. What you are trying to achieve is a loose light batter, so you may not need all of the liquid. When the mixture is well combined, pour the batter evenly into the loaf tins. Bake for 30 - 35 minutes or until golden and firm on the top. Leave to cool briefly, then slice and enjoy plain or with butter. 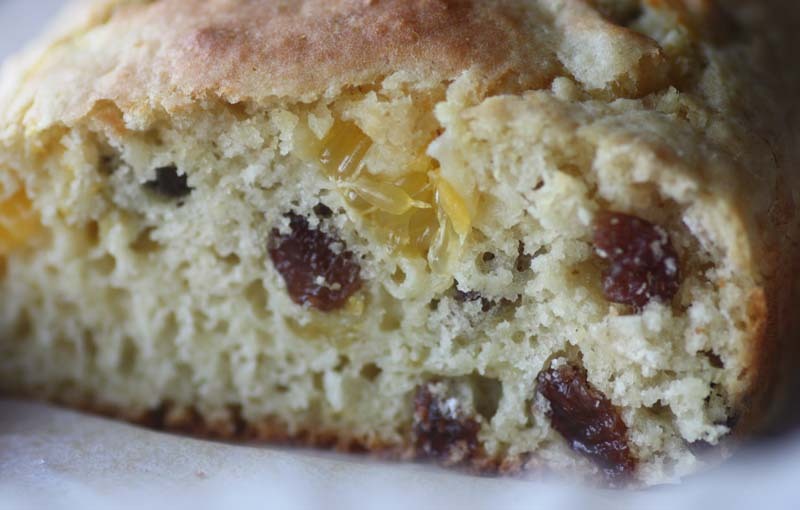 Adapted from Lucy’s Date and Orange Scones. This is the first time I have ever made a peanut soup, albeit it with peanut butter from a jar. I know tut tut, I should have made the peanut butter from scratch. I hang my head down in shame as I had no excuse, I even had a large bag of peanuts in a packet. D was a bit hesitant in trying this soup, saying curry powder and peanut butter sounded like a strange combination. However, after the first spoonful, he was quite happy to finish it off. He admitted though that he could not eat too much of it, as this is a rich creamy red soup. 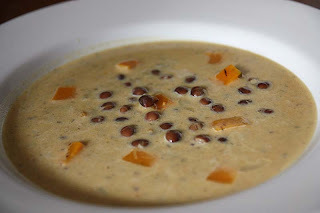 Other than the peanuts - a main crop in Senegal, I don't know exactly what makes this soup Senegalese as this was not explained by the food writer. I've read somewhere that 'Senghalese' should have read 'Singhalese' (cuisine from Sri Lanka), but I don't know how much truth is in that. Heat the oil in a saucepan, then add the onion, garlic and coriander stems. Give a stir, then cook over high heat for a few minutes to warm the onion. Lower the heat and cook until the onion has softened, about 10 – 12 minutes. Stir in the cayenne and curry powder. Add the tomatoes, including all their juice and a pint of water. Stir well and bring to a boil. Drop in the peanut butter and simmer until the onions are soft and the peanut butter has dissolved, about 15 minutes. 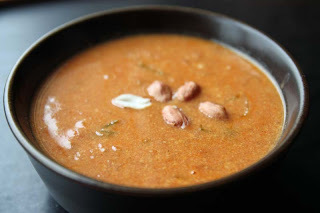 Season the soup with salt and serve. 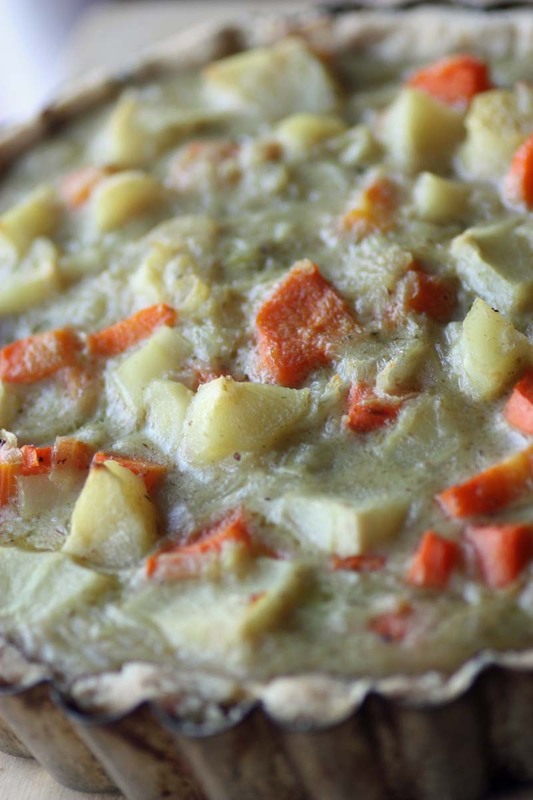 Adapted from Vegetable Soups from Deborah Madison.